Diseases of the adrenal gland have been treated surgically since the nineteenth century. Since the first planned adrenalectomy by Sargent in 1914 for a large adenoma, various approaches to this operation have been developed. Open techniques have paved the way for less invasive approaches. In 1992, Gagner et al. reported their initial experience with transperitoneal laparoscopic adrenalectomy. Since then, minimally invasive techniques have gained wide adoption, partly due to decreased postoperative pain, lessened morbidity, and quicker patient recovery. 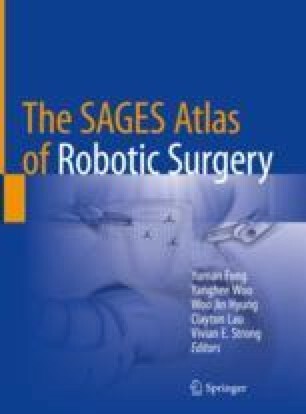 The advent of robot-assisted techniques has overcome many of the limitations of traditional laparoscopy. In 2001, Horgan et al. first reported their experience using a da Vinci® robotic system to perform adrenalectomy. Contemporary literature continues to support the use of robot-assisted techniques to treat adrenal pathology [3–6]. When planning for surgeries of the adrenal gland, complete imaging and endocrine workup is warranted to achieve an accurate preoperative clinical diagnosis.